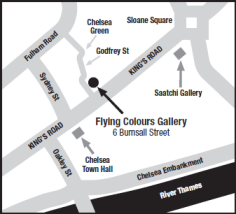 The gallery is situated just off Kings Road in Chelsea. It is about five minutes walk from Sloane Square tube station (Circle and District lines). To walk to the gallery from Sloane Square exit the station and head west into Kings Road. Continue along Kings Road until you pass Waterstones on your right and shortly afterwards is Burnsell Street where the gallery is located, along with several other businesses. South Kensington tube station is similar distance away. Buses numbers 11 , 22 , 211 and 19 all travel down Kings Road and stop minutes from the gallery.